As soon as the vernal equinox hit on March 21st—and wow did it hit hard when the ‘supermoon’ rose on the evening of March 20th—spring sprang on us and I immediately began to crave the fresh flavors associated with the season. That’s not to say that Spaghetti Bolognese isn’t cooked and eaten on a hot summer day around here, but after a long winter I’m drawn to lighter, brighter flavors and aromas. 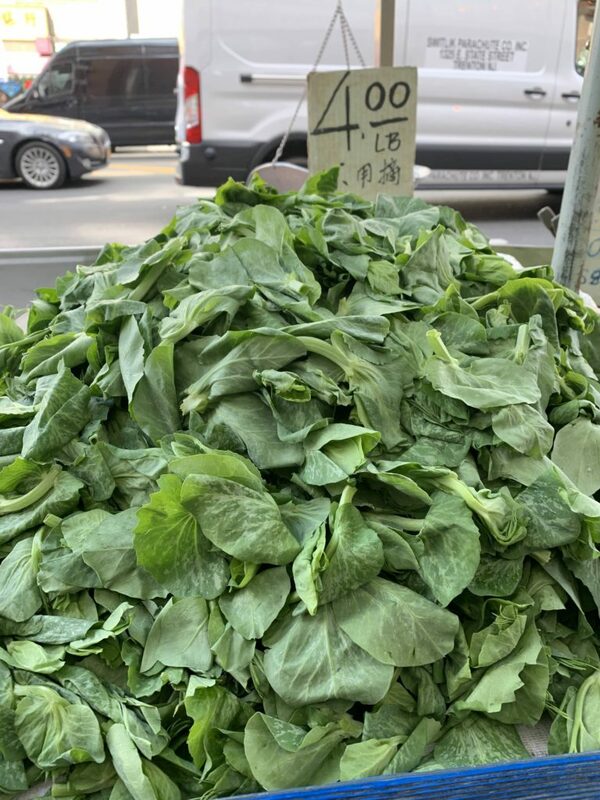 As new ingredients popped up in the markets, I started contemplating Easter meals, Passover dishes, and even food typical of the Persian New Year called Nowruz (all those years as a food editor taught me about many holidays through food traditions). 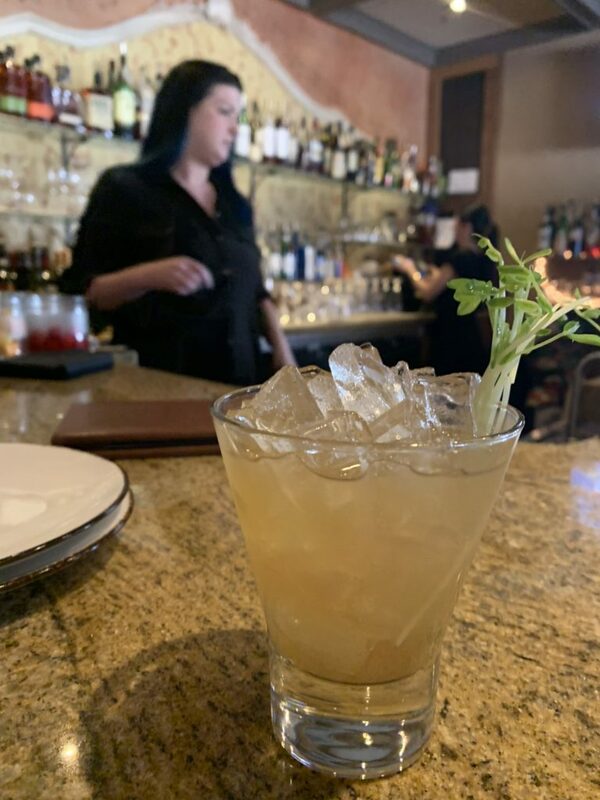 Traveling for work last week I was given another taste of the season when I was served a specialty cocktail at dinner: A pea-infused gin concoction, which may sound strange, but was surprisingly delicious with its fresh and unfamiliar flavors. And then there’s lamb. “Spring lamb” used to denote the young animals born in spring, even though nowadays most lamb bought for cooking are from 6-12 month old animals. And on a different meal out last week we tasted this quintessentially spring protein, albeit in an unfamiliar guise, at the excellent Indian restaurant, Manam in Malvern PA, in a preparation called ‘Pasanda,’ in which the meat is cooked in an intoxicating sauce of ground nuts, spices and cream. Lamb lingered in my thoughts while shopping at my local butcher, Hudson and Charles, on Monday. There was a small amount of lamb stew meat left in the case (they break down whole animals once a week) so I grabbed just under a pound to take home. 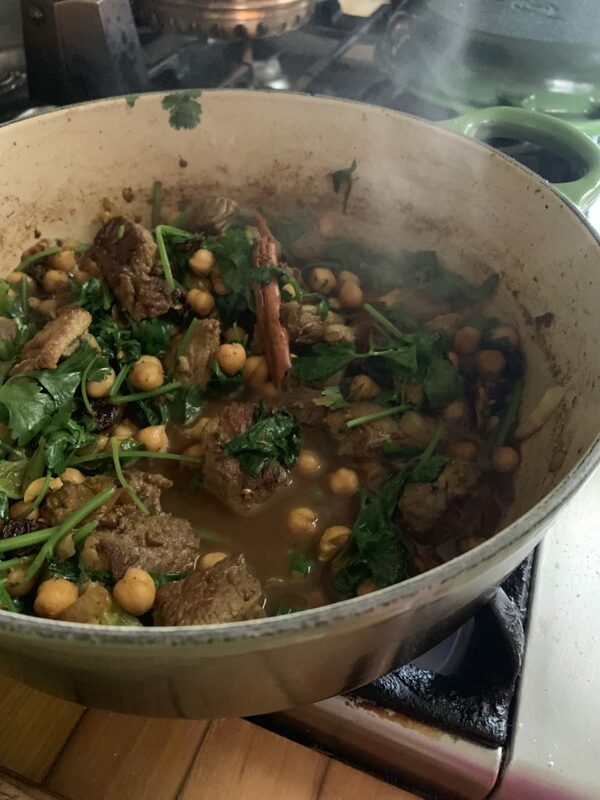 With no plan in mind, just the lingering afterthoughts of the deliciously spiced Pasanda, a perusal of several Middle Eastern cookbooks for inspiration helped me settle on a spring stew plan for supper. Not a long simmering one—a fresh, light, quick-cooking stew. Along with a can of chickpeas from the cupboard, the meat stretched into a delicious meal, with plenty for 5-6 servings. I let my mind and taste buds wander, pulled out some ingredients and experimented, the whole time happy to be back in my home kitchen. You never know until you try it, but the first recipe attempt was really good, even better tasting as leftovers for the next day’s lunch. 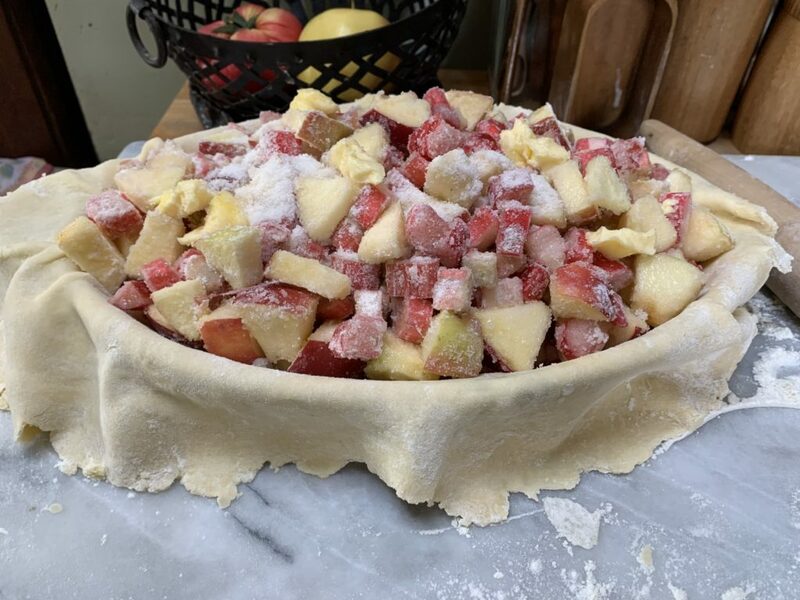 Hopefully it inspires you to jump into the kitchen and freshen up your meal rotation, or at least start to enjoy some spring specialties while they’re in season. 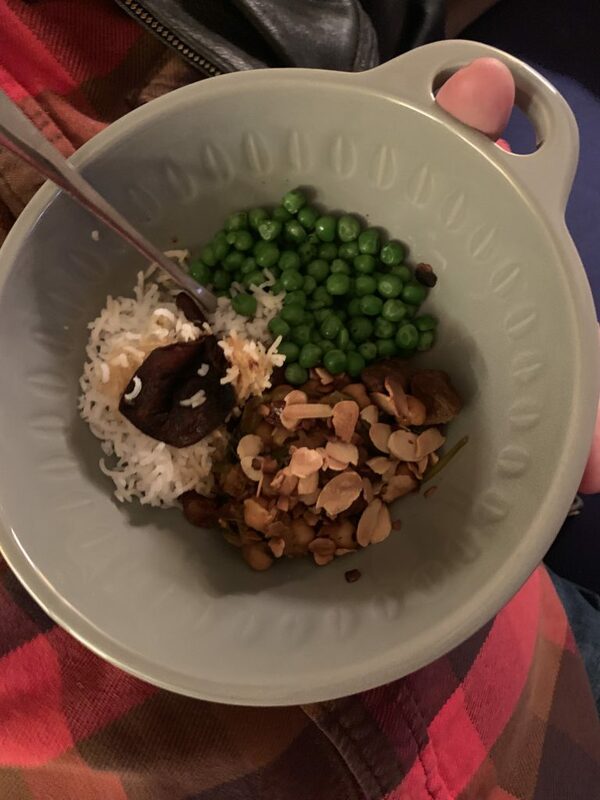 Persian Potato Tahdig (and green peas) was served on the side, but that recipe needs more work! 1. Salt and pepper the lamb. Brown on both sides. Add the shallots and scallions, and sauté to soften, about 5 minutes. Add the chickpeas. 2. Stir in the cinnamon, coriander, cumin and turmeric. Cook for a few minutes. Add the cherries and fresh coriander and stir to combine. 3. Pour in the chicken stock. Bring to a boil, cover, reduce heat to low and simmer until the lamb is just tender and cooked through but light pink in the middle, about 15 minutes. Add lemon juice. Salt to taste. Garnish with almonds and a sprinkling of fresh coriander. Serve with rice.